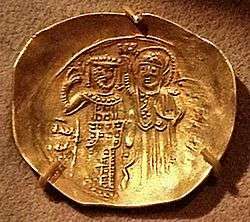 A successful soldier from a military family, John was chosen in about 1216 by Emperor Theodore I Laskaris as the second husband for his daughter Irene Laskarina and as heir to the throne, following the death of her first husband, Andronikos Palaiologos. 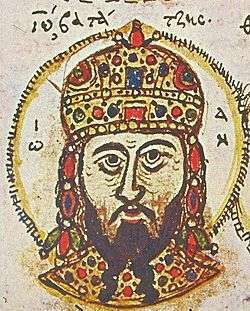 This arrangement excluded members of the Laskarid family from the succession, and when John III Doukas Vatatzes became emperor in mid-December 1221, following Theodore I's death in November, he had to suppress opposition to his rule. The struggle ended with the Battle of Poimanenos in 1224, in which his opponents were defeated in spite of support from the Latin Empire of Constantinople. John III's victory led to territorial concessions by the Latin Empire in 1225, followed by John's incursion into Europe, where he seized Adrianople. Moreover, John III is credited with carefully developing the internal prosperity and economy of his realm, encouraging justice and charity. In spite of his epilepsy, John III had provided active leadership in both peace and war. A half-century after his death, John III was canonized as a saint, under the name John the Merciful, and is commemorated annually on November 4 in the Orthodox calendar. Alice Gardiner remarked on the persistence of John's cult among the Ionian Greeks as late as the early 20th century, and on the contrast she witnessed where "the clergy and people of Magnesia and the neighbourhood revere his memory every fourth of November. But those who ramble and play about his ruined palace seldom connect it even with his name." 1 2 Marek, Miroslav. "The Batatzes family". Genealogy.EU. External link in |publisher= (help). Emperors of Byzantium. 1 October 2002. ↑ George Akropolites. The History. Trans. Ruth Macrides. New York: Oxford University Press, 2007, p. 160. ↑ Treadgold, Warren (1997). A History of the Byzantine State and Society. Stanford: University of Stanford Press. pp. 719–721. ISBN 0-8047-2630-2. 1 2 See Treadgold. History of the Byzantine State and Society, pp. 722–724. ↑ Treadgold. History of the Byzantine State and Society, p. 728. ↑ Steven G. Ellis; Lud'a Klusáková (2007). Imagining Frontiers, Contesting Identities. Edizioni Plus. pp. 134–. ISBN 978-88-8492-466-7. ↑ Treadgold. History of the Byzantine State and Society, pp. 729–730. ↑ Agelarakis, P. A. (2012), "Cretans in Byzantine foreign policy and military affairs following the Fourth Crusade", Cretika Chronika, 32, 41-78. ↑ Great Synaxaristes: (Greek) Ὁ Ἅγιος Ἰωάννης ὁ Βατατζὴς ὁ ἐλεήμονας βασιλιὰς. 4 Νοεμβρίου. ΜΕΓΑΣ ΣΥΝΑΞΑΡΙΣΤΗΣ. ↑ Ostrogorsky, George. History of the Byzantine State. New Brunswick, N.J: Rutgers University Press, 1969, p. 444. Marek, Miroslav. "The Batatzes family". Genealogy.EU. External link in |publisher= (help), Retrieved 17 January 2009.